Serene Musings: Kentucky Wildcats Undefeated? College basketball fans in Kentucky have a lot to be happy about this year. After a decade of perceived underachieving with Tubby Smith, and a disastrous two years under Billy Gillispie that saw the Cats miss their first NCAA tournament since Barack Obama was a teenager, new coach John Calipari has brought talent and top-tier coaching skills to the program and reinvigorated the fan base. In the preseason polls, Kentucky was ranked 4th by the AP and 5th by ESPN/USAToday. This was largely driven by the changes Calipari made in the roster, bringing in a number of talented freshmen and waving goodbye to several Gillispie-era players that realized their playing time was about to be drastically reduced. Now at the end of week three, the team is 6-0, ranked 5th in both polls. In looking at Kentucky’s schedule for the remainder of the regular season, it is hard not to ask yourself whether Kentucky has the chance of going undefeated in the regular season this year. I don’t pretend to have a crystal ball, and I don’t intend to make any predictions about the SEC or NCAA tournaments. But I do think a good case can be made for the Cats to have a chance at ending the regular season without a loss. While UK undoubtedly has enormous talent, they have not yet displayed, in the first six games, the kind of cohesion and chemistry that one expects to see from a championship team (or an undefeated team). Watching them play is like watching a game of street ball. There is a lot of running and gunning, not much organized defense, a lot of turnovers, a lot of slam dunks and 3-pointers, and frequently a lot of fouls. They play exactly like you’d expect a team top-heavy with freshman superstars to play. This has led them to several “close calls” already in just the first six games against teams without nearly as much talent. Only a buzzer beater won the game over Miami of Ohio, and when they played Stanford, they were down most of the game and only pulled out the victory in overtime. For Kentucky to have any chance at going undefeated or making a serious NCAA tournament run, John Calipari has to reign in this street ball style of play and harness the talent he’s got on his roster. He has to get the chemistry down and get the team playing like a team, and not like a group of five individuals racking up statistics. If he’s not able to do that, then what I have to say below will all be academic; if they keep playing like they’ve been playing these first six games, UK will likely find it tough to beat teams like North Carolina, Louisville, and some of their SEC rivals. 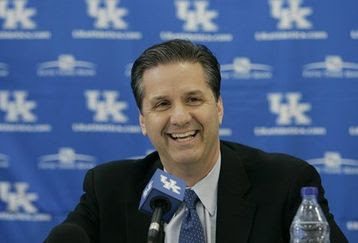 Therefore, my prediction about an undefeated season is contingent on Calipari getting a handle on this team’s talent and harnessing it to produce the kind of sharp, clean, team-oriented play that is vital for a championship-caliber team. 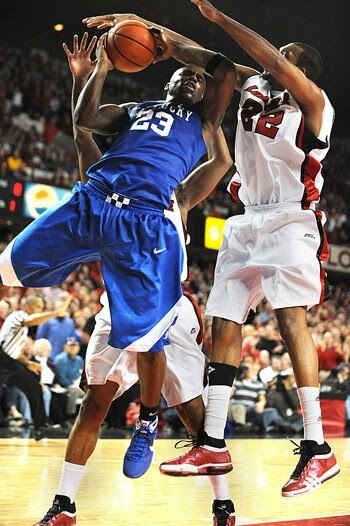 With that established, what exactly are the reasons why UK has a chance to go undefeated this season? First, the aforementioned talent. This is perhaps the most individually-talented UK basketball team since at least the Rick Pitino era of the mid-90’s – maybe even of all time. At least four, and perhaps all five of their starters will almost certainly go on to have successful NBA careers. That kind of star power has been rare in the last ten to twelve years for the Cats. There are currently only nine former UK players in the NBA, and two of those are from the Pitino era. A team with this sort of talent definitely has what it takes to go undefeated. Second, UK has depth. This isn’t just a team with four or five really, really good starters, and seven or eight average bench players. So far this year, they have six players playing twenty minutes or more per game, and eight players seeing fifteen minutes or more per game. They are so deep that senior Perry Stevenson, who has been a starter for much of his four years at UK, is now the tenth man off the bench for John Calipari. Furthermore, in terms of scoring, they have three players scoring better than 2:1 in terms of points-per-minutes-played, (1 point or more for every two minutes played), and three more players scoring better than 3:1 (1 point or more for every three minutes played). 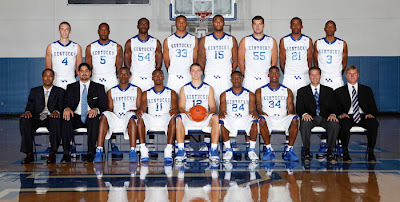 Talent combined with depth makes this a UK team that could go undefeated. Third, UK has a veritable superstar in John Wall. Because the NBA now has a rule disallowing anyone under the age of nineteen to be drafted, top-ranked high school players are essentially required to either attend at least one year of college, or play overseas for a year. If not for that rule, Wall would have gone straight from high school to the NBA, and probably would have been one of the top two or three draft picks. As it is, he will play at UK for a year and then go into the NBA in 2010, where he will almost certainly be the number one draft pick (barring a major injury). As history tells us, teams that go undefeated are almost always anchored by a superstar player, surrounded by depth and talent. Finally, there is the issue of UK’s schedule. Currently, only three teams in the SEC are ranked in the top 25, including Kentucky. The other two teams are Vanderbilt and Tennessee. Vanderbilt is barely in the mix, currently ranked 24th. Tennessee is a solid team currently ranked 11th (9th in the AP poll), but they lost this week to Perdue, which will drop them several spots in next week’s rankings. Other than that, the SEC is thin again this year in talent. Since it has not historically been unusual for Kentucky to go undefeated in conference play, the chances of it happening again this year – considering their talent, depth, and star power – are very, very good. That leaves the first half of the season – the non-conference portion of their schedule. Kentucky has already played and won the first six of those games. Among those non-conference teams they have left to play, only three present a serious challenge – North Carolina, Connecticut, and Louisville. North Carolina is currently ranked 12th (11th in the AP poll). They have already lost once, and will have a tough match-up next week against 2nd ranked Michigan State. 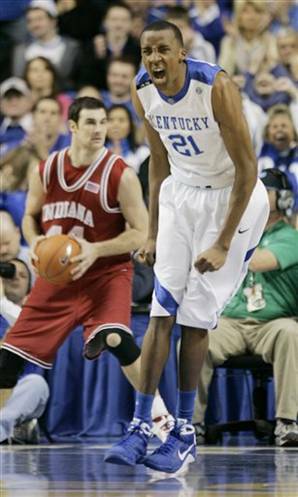 If they lose that game, they will come into Kentucky next weekend with two losses already on their schedule. In either case, Kentucky is a superior team to North Carolina this year, and will play them with a home court advantage. As for Connecticut, the 13th ranked Huskies lost today to Duke. That will drop them several spots in next week’s rankings. 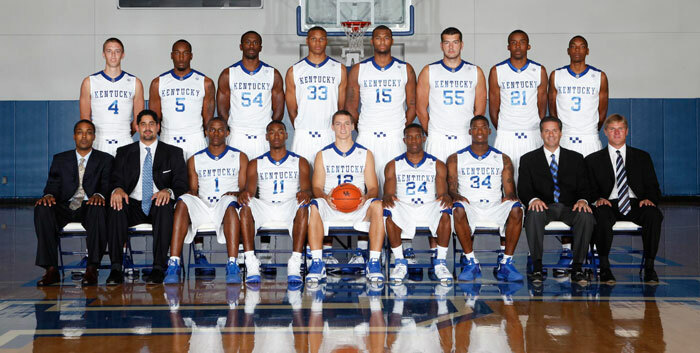 They will likely still be somewhere in the mid-teens when they play Kentucky on December 9th. The game will take place on the neutral court of Madison Square Garden. Finally, Louisville is currently ranked 16th. Kentucky, however, does not play Louisville until January 2nd, and it is likely that Louisville will have moved up significantly by that time. Louisville will not play any ranked opponents until that match-up with the Cats. It is a strong likelihood that Louisville will be either undefeated or have no more than one loss when they come to Lexington in early January. Thus, by that time, they will likely be well-established with a top-10 or even top-5 ranking. The annual UK-UL game is always a fight to the finish, and the pre-game ranking or win/loss total for each team rarely predicts who will win. Last year, for instance, UK beat the Cardinals, even though Louisville was the far superior team (Louisville was a 1-seed in the NCAA tournament and went to the Elite Eight; UK didn’t even make the tournament). Thus, with both teams potentially undefeated and in the top 5 by that time, the UK-UL game this year should be a fun one to watch. Kentucky will have home court advantage, however, and Louisville has only beaten Kentucky at home four times since the rivalry started in 1983. In any case, those three teams – Connecticut, North Carolina, and Louisville – are the only three teams that should present a threat to UK in non-conference play. 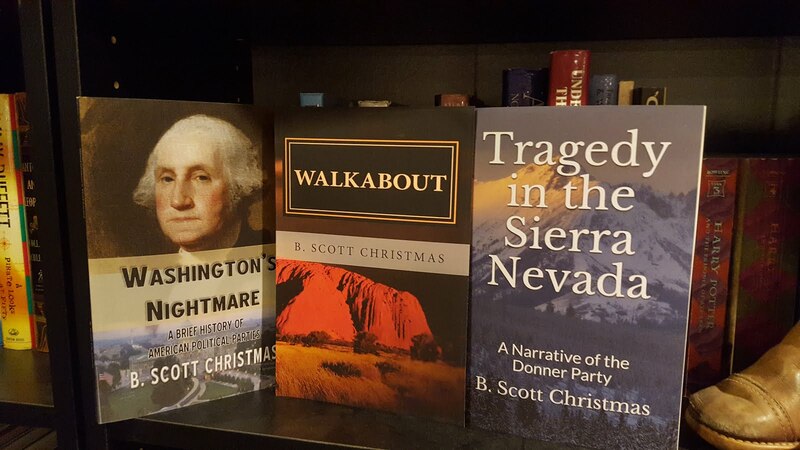 And presently, all three of them are ranked well below Kentucky in the polls. In fact, as it currently stands, Kentucky has only five ranked opponents left to play on its schedule this year, and none of them are even in the top 10. If and when Kentucky loses a game, it will be to an opponent that is ranked below them, or not ranked at all. Given the team’s immense talent, depth, star power, and relatively easy schedule, it seems that Kentucky has a very good chance – if they get their chemistry together – of going through the regular season undefeated this year. Kentucky has made it through the tough portion of their non-conference games without a loss. They are now 10-0, the first time they have done that in 14 seasons. UK is now 15-0, having just dispatched Louisville. With that win, they have completed a perfect, undefeated non-conference schedule. Next week they begin conference play.